Mallory doesn't know what to say, so she's mostly silent. Her nickname from the past is Mouse, because she was quiet when she had to be. It was necessary for survival. Four years ago Mallory got out of the evil situation she'd been in for years. She gained two wonderful caring adoptive parents, but she lost contact with someone very dear to her. Rider was the boy who always protected her, who was there when she was sad and who took the blame for some of her 'mistakes'. Four years later Mallory is still trying to find a sense of normalcy. She has a good home now, but speaking remains difficult. She's homeschooled, but will spend her last year at a regular high school to prepare for college. She's stunned when she meets Rider, who's going to the same school. Their childhood connection hasn't been broken and there's even more between them than there used to be. They're older and they have such a strong bond that they can't stay away from each other. They both have their problems, Mallory is learning to speak up and Rider needs something that nobody can give him. While Rider seems to do okay he makes a lot of bad decisions that have lasting consequences. Mallory needs to find her voice or she will risk losing everything she's gained all over again. The Problem With Forever moved me to tears. 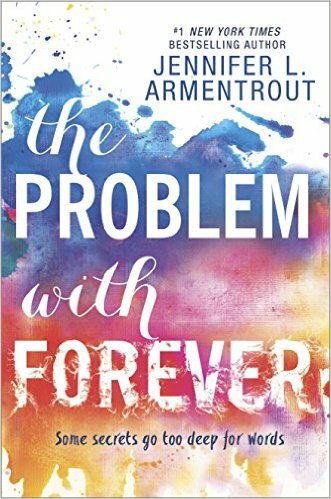 Jennifer L. Armentrout writes about a difficult topic in a beautiful sensitive way. What Rider and Mallory have is precious, it isn't something that can be labeled and it goes really deep. I sometimes wanted to look away to give them privacy, because I felt like I was seeing too much. That's how intense this book is and it's fantastic. There's so much grief, pain and sorrow, but there's also love, hope and belief. Mallory prefers to hide, she doesn't know how else to react as it's what she's always learned to do. An instinctive reaction is hard to unlearn, but she gives it her all. She consciously chooses and that makes her so admirable. She survived a hellish situation and she needs to find a way forward while always carrying her history with her. Rider has recued her many times and he keeps doing what he does best. He's sensitive and damaged, but he has a chance to improve and make things better. That is the amazing message of this book, forgetting isn't possible, but living with what you've been given in life is. The Problem With Forever is special. It's a heavy story and it's definitely impressive. It made me cry and at the same time I couldn't stop reading. I think Jennifer L. Armentrout has written a brilliant story that everyone should read. It amazes me that JLA continues to write such intense stories that are so different from one another! I haven't read this one yet, but putting it on my wishlist. This sounds like a emotional story I'll enjoy.